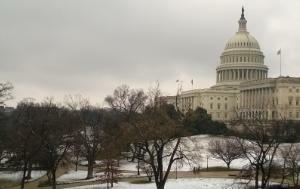 The 83rd Inter-Parliamentary meeting (IPM) of the Transatlantic Legislators' Dialogue, scheduled to take place in Washington, DC on 5 December 2018, was postponed for next year. The four IPM sessions planned with the House of Representatives were derailed and had to be postponed due to the passing and funeral arrangements of former President George H.W. Bush. Despite this last minute change, the EP delegation held two full days of meetings on 3 and 4 December 2019 with Senate and the Administration (including the Departments of State and Defence and the Office of the US Trade Representative) and a working meal with Members of the House. In a deeply moving and significant occasion, the US Delegation Members also got the opportunity to pay their respects before the casket of the late President Bush under the Rotunda of the Capitol, on behalf of the European Parliament. More information on the meetings and the postponed IPM will follow. Lawmakers from the European Parliament and the US Congress met in Washington DC on 5th December 2017 for the 81st EU-US inter-parliamentary meeting under the Transatlantic Legislators' Dialogue. Their Joint Statement reaffirms the importance of EU-US legislative cooperation based on common values, shared principles and important transatlantic challenges. Read the full statement below. 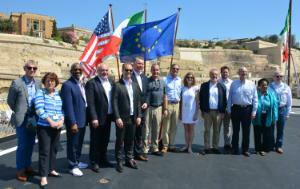 Members of the European Parliament and the United States Congress, held their 80th Inter-Parliamentary Meeting of the Transatlantic Legislators' Dialogue in Malta. 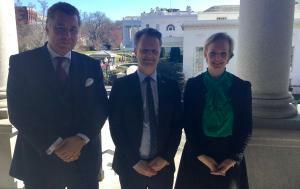 The Bureau (Chair and Vice-Chairs) of the Delegation for relations with the United States (D-US) and the Transatlantic Legislators' Dialogue met with its US counterpart on 21-24 February 2017 to prepare for the 80th EU-US inter-parliamentary meeting, to be held in Valletta on 2-3 June 2017. Members of the European Parliament and the United States Congress, held their 79th Inter-Parliamentary Meeting of the Transatlantic Legislators' Dialogue in Washington DC. Members of the European Parliament and the United States House of Representatives, held their 78th Inter-Parliamentary Meeting of the Transatlantic Legislators' Dialogue in The Hague. D-US Bureau delegation, 8-10 February 2016, Boston, Concord and Washington D.C. The Bureau (Chair and Vice-Chairs) of the Delegation for relations with the US (D-US) met its US counterpart and stakeholders to prepare for the EU-US inter-parliamentary meeting to be held in The Hague on 26-27 June 2017, as well as for upcoming US elections. 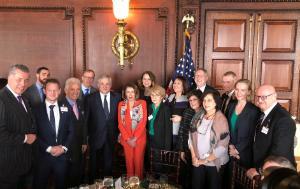 Members of the European Parliament and the United States House of Representatives, held their 77th Inter-Parliamentary Meeting of the Transatlantic Legislators' Dialogue in Washington DC. Following previous discussions, they exchanged views on: bringing the international trade agenda forward, cooperating on energy security and opening a path of cooperation on a transatlantic digital economy, and tackling current foreign and security matters of transatlantic concern. 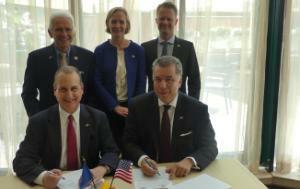 Members of the European Parliament and the United States Congress, held their 76th Inter-Parliamentary Meeting of the Transatlantic Legislators' Dialogue in Riga, on 27 and 28 June 2015. Based on common values and shared principles, they discussed ways to deepen and strengthen the relationship, and in particular to increase the readiness to jointly address the diverse set of global security, economic, and environmental current challenges. The Bureau (Chair and Vice-Chairs) of the Delegation for Relations with the United States (D-US) met its US counterpart and stakeholders in preparation for the 26th EP-US Congress inter-parliamentary meeting to be held in Riga from 27-28 June 2015.